What happens at our Flood Forecasting Centre? I work in the Flood Forecasting Centre, a joint partnership between the Environment Agency and the Met Office. This is based in the Met Office’s 24/7 operations centre in Exeter. Our job is to tell people where the flood risk is likely to be over the next few days so they can prepare to respond. We forecast for all natural forms of flooding - river, surface water, tidal/coastal and groundwater for England and Wales. My love of rivers and the environment started as I was growing up in rural Kent. My father used to take me fishing on the River Medway and sea fishing at Dungeness. He also worked for a company who used lots of water in a paper mill. I remember living through extreme weather – both a drought and flooding. We had to get our drinking water from standpipes and I also remember seeing some very impressive floods where we lived. Brian's job is to ensure all our forecasts are delivered on time and are accurate. From an early age I understood how important water is, and felt well-placed to work for the Environment Agency. I joined in 1997 and my first job was to look after all the licences to take water from rivers and groundwater in Kent – a great job with lots of field visits – and I was being paid! Then we had some devastating floods in 2000. After talking to people whose lives had been affected by flooding, I decided this was the area I wanted to work in. After the major floods of 2007, the Government carried out a review which recommended that the Met Office and the Environment Agency form a new Flood Forecasting Centre. The idea was to forecast with better lead times and understand how the weather and the water on the ground interact. I was very fortunate to be asked to help set this up and lead the operational team. We created a brand new job called Hydrometeorologist – which is a fancy name for a weather forecaster who is also an expert in water on the ground – in our seas and rivers. We are open 24/7 providing forecasts of the flood risk in England and Wales for the next 5 days. We can also provide briefings for even longer if we see some weather patterns concerning us. Our job is to tell the emergency planners and responders (including the police and fire brigade) where the flood risk is likely to be so they can make sure they have all their people and equipment in the right place. We also help the Environment Agency be able to issue Flood Alerts when flooding is possible and Flood Warnings when flooding is about to happen. A Severe Flood Warning is the highest level the Environment Agency issues and this means that there is a danger to life. 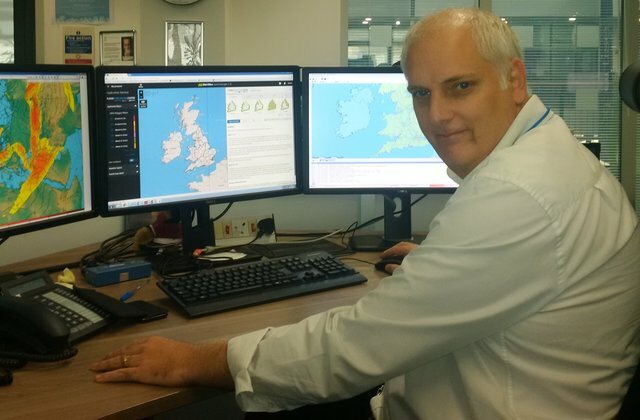 My job is to ensure all our forecasts and ‘flood guidance statements’ are delivered on time and are accurate. I manage and lead the Hydrometeorologists and also produce briefings for senior managers in Government, the Environment Agency and the Met Office. I have to know a lot about the weather and the flood risk – and be able to brief non-technical people during operational calls. My job is immensely varied. I have appeared on the One Show and a Channel 4 documentary and I have shown all sorts of people, including senior politicians and royalty, around the Flood Forecasting Centre. When it is flooding we have to brief into the highest levels of Government – including briefing the Prime Minister. One particular forecast that stands out was telling the London Olympics organising committee if thunderstorms were going to occur over the stadium during the opening ceremony – including the “Queen” parachuting into the stadium! Flooding can occur at any time – so my job does also involve sometimes working nights and bank holidays. Last year I worked on Christmas Day and Boxing Day. It was important a manager was in as we needed to escalate to our highest risk on Christmas night into Boxing Day morning. If we had not done this the emergency responders would not have been able to respond as effectively as they did. There is always a hydrometeorologist from the team working no matter what the weather is doing – providing reassurance and early warning to responders. I am immensely proud of the team I work for. We get to use all the expertise and resources of the Environment Agency and the Met Office to provide as accurate a forecast as we can with as much notice as we can. We see the first signs of problematic weather as the supercomputer in the Met Office starts to pick it up. We work with the Met Office Chief Meteorologist to work out what this means on the ground. We provide advice to the Environment Agency Modelling and Forecasting teams and together we produce the Flood Guidance Statement. Using our advice and products the Environment Agency also decide where to issue Flood Warnings – you can sign up for flood warnings if your property is at risk of flooding. This also allows the Environment Agency frontline teams to know where to carry out vital work such as operating their flood defence structures, putting up temporary barriers and warning communities. We also continue to forecast after the rain has passed as to how long the rivers will remain high – very important when considering recovery. I genuinely feel that our small team makes a vast difference to the forecasting of flood risk for England and Wales. I hope that due to responders and people receiving warnings they can take appropriate action and ultimately properties are protected and lives are saved.